Following an announcement last December, accessory company Kanex today launched its GoPower Watch Stand for the Apple Watch. The Apple MFi-certified accessory includes an integrated charging puck that recharges and displays the Apple Watch, as well as an additional USB port on the back that can simultaneously charge an iPhone, iPad, or any other USB-compatible device. 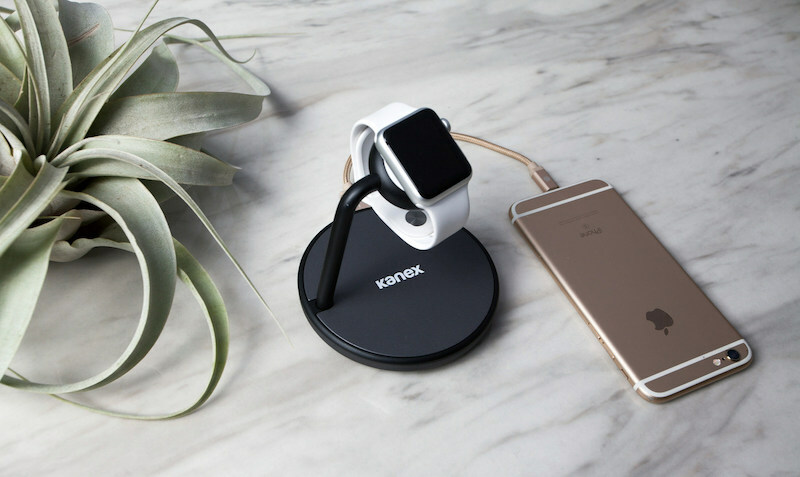 "The Apple Watch, as with all Apple products, was designed with elegance in mind, and the Kanex GoPower Watch Stand is no different," said Andrew Truong of Kanex. "It features a smart minimalist design that elevates the Apple Watch for a convenient viewing angle, while also eliminating cable clutter. Plus, with an additional USB port on the back, our Kanex GoPower Watch Stand is the perfect all-in-one solution." The company also announced that its GoPower Plus power bank now comes in Rose Gold and Matte Black colorways. The power bank supports simultaneous charging to two devices and has an 8,000 mAh battery with an integrated MFi-certified Lightning adapter. The accessory was previously available in Space Grey and Gold. Anyone interested can purchase the GoPower Watch Stand for $69.95 and the GoPower Plus for $59.95 on Kanex.com. $70 and no nightstand mode. No buy. Heck of a lot for a simple stand. The fact it can charge an additional device simultaneously is An advantage other stands don't offer at this price point. I see everyone complaining about the price. You do realize this is the first stand to not make you pay a separate apple watch charger. It saves you 29.99 right there! Though this Kanex is a bit cheaper than the above, it's less convenient for my needs (I own the Belkin and it has been quite useful for camping and traveling). $70 stand for my $180 watch? Nope.